In Wisconsin’s race for governor, both sides are playing “spin the voter” with Republican incumbent Scott Walker’s record on jobs. Democratic challenger Mary Burke and her allies have hammered Walker with ads stating that “Wisconsin’s job growth is dead last in the Midwest.” Not so. His job gains are well below the national average and just half of what he promised when elected, but not as bad as Democratic ads make out. Walker is countering with an ad saying, “We’ve come from losing over 133,000 jobs, to gaining over 100,000 jobs.” That’s not quite accurate either. The state had been regaining jobs for more than a year at the time he took office, and the pace of gains didn’t improve. Walker said when inaugurated on Jan. 3, 2011: “My top three priorities are jobs, jobs and jobs. … We have an ambitious goal: 250,000 new jobs by 2015. I know we can do it.” He hasn’t delivered. As of July, the most recent month for which the Bureau of Labor Statistics has released state-by-state figures for seasonally adjusted total nonfarm employment, Wisconsin had gained just over 112,000 jobs since Walker took office. So with only five months to go before the end of his first term, Walker wasn’t even halfway to his goal. But that said, Walker’s record isn’t as terrible as Democrats make out. An ad from the Burke campaign that ran last month and a very similar ad from the liberal, pro-Democratic Greater Wisconsin PAC both claimed that the state is “dead last” in job growth among Midwestern states. That’s not so when measured by the most timely, and commonly accepted, official statistics. 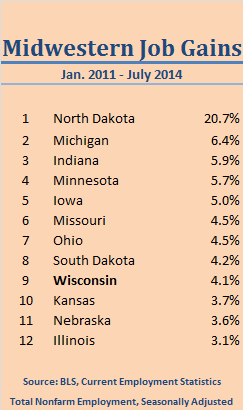 It’s correct that by one statistical measure Wisconsin did rank last in percentage gains in jobs among the 10 states that rapidly scroll by on screen. But that’s misleading. For one thing, the U.S. Census lists 12 states — not 10 — as being part of the officially defined “Midwest.” The list used in the Democratic ads omits Missouri and Kansas. More important, the statistical measure cited in the ad is several months out of date, and is not the metric commonly used by economists and reporters when reporting on employment trends. The commonly accepted figures are current as of July, making them far more timely than the figures cited in the ad, which are current only through the end of last year. And since December, Wisconsin has had a greater percentage increase in jobs than five other Midwestern states: Ohio, Kansas, Minnesota, Nebraska and Illinois. The ad cites the BLS Quarterly Census of Employment & Wages, which is a tally of all workers covered by unemployment insurance, making up about 97 percent of all workers. The QCEW is an excellent tool for some purposes, and in fact is used as a check on the accuracy of the BLS’ more timely surveys. But the comprehensive, quarterly figures take many months to gather. The next release (covering January, February and March of this year) won’t be out until Sept. 18. That’s why the preferred figures for measuring employment come from the series called Current Employment Statistics, which is based on the payroll records from 144,000 private and government employers, a massive sample that covers over half a million workplaces. 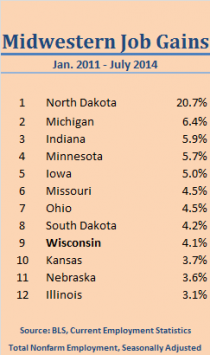 When using the most up-to-date figures on employment from the CES, Wisconsin actually ranks ninth among the 12 Midwest states. That’s not great, but it’s not “dead last,” either. The Democratic exaggerations may be having the desired effect; recent polling is showing a very tight race. The Huffington Post’s composite average of recent polling results puts Walker only a fraction of a percentage point ahead of Burke, while the Real Clear Politics composite shows Burke with a lead of 1.7 percentage points. As we’ve noted, the actual job gain was 112,100 as of July, so that much of Walker’s ad is accurate. Of course, Walker doesn’t mention how far short that falls of his promised 250,000 jobs. His statement about “losing over 133,000 jobs” refers to what happened during the last term of his predecessor, Jim Doyle. The actual loss was 125,600, as measured by BLS’ most recently revised figures. But reality isn’t quite so black and white as Walker’s comparison suggests. For one thing, by the time Walker took office Wisconsin had already turned the corner on the job losses that began in mid-2007, the result of a national financial crisis that was the worst since the Great Depression. In January 2011, the month Walker was sworn in, the state had already regained nearly 35,000 of the jobs it had lost. In fact, the average monthly gain in the 13 months before Walker took office – 2,700 jobs a month – is the same average monthly gain that has occurred since. Furthermore, Wisconsin has lagged far behind the national average in the pace of job growth during Walker’s tenure. Wisconsin’s job total has gone up 4.1 percent under Walker, but the national gain has been 6.2 percent during the same period. And unlike the nation as a whole, Wisconsin has yet to regain all the jobs it lost during and after the Great Recession of 2007-2009. Wisconsin’s July total was still more than 29,000 (about 1 percent) shy of the state’s peak employment, reached in June 2007. But also as of July, the U.S. had regained all the jobs lost plus 611,000 more, a gain of about 0.5 percent. Ordinarily, we would remind our readers that governors have only limited influence over jobs and the economy in their states. In this case, Walker made the state’s employment record a legitimate target by emphatically promising to deliver a quarter-million jobs, and failing to do so. But that doesn’t give Democrats a right to claim that his record is worse than it really is, any more than Walker has a right to claim credit for a dramatic turnaround that was under way well before he took office, and which hasn’t gained any momentum since then. Next StoryTillis: Education Budget Backer or Hacker?